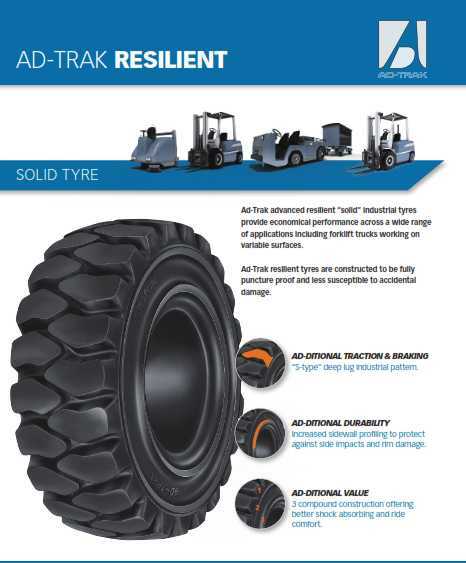 AD-Trak is a high traction puncture proof resilient forklift tyre that provides a great lifespan for medium duty applications. AD-ditional firm seat due to extra tough base compound and high tensile steel bead-rods. AD-ditional traction & braking due to s-type wide & deep lug pattern. 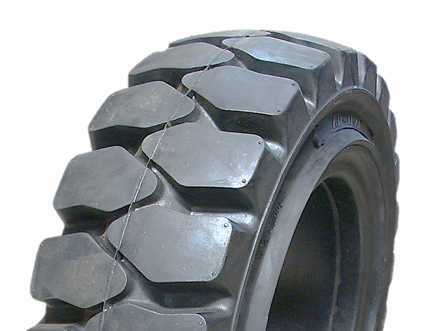 AD-ditional life time due to extra deep pattern, extra tough tread compound, extra shape reinforced against chunking. AD-ditional side wall stability due to very wide tread & shoulders. AD-ditional flexibility & shock absorbing riding comfort, energy saving, due to ad-vanced natural rubber compound & newly designed sidewall shape. AD-ditional rim & sidewall protection due to ad-vanced tyre engineering and technology.